Hello! 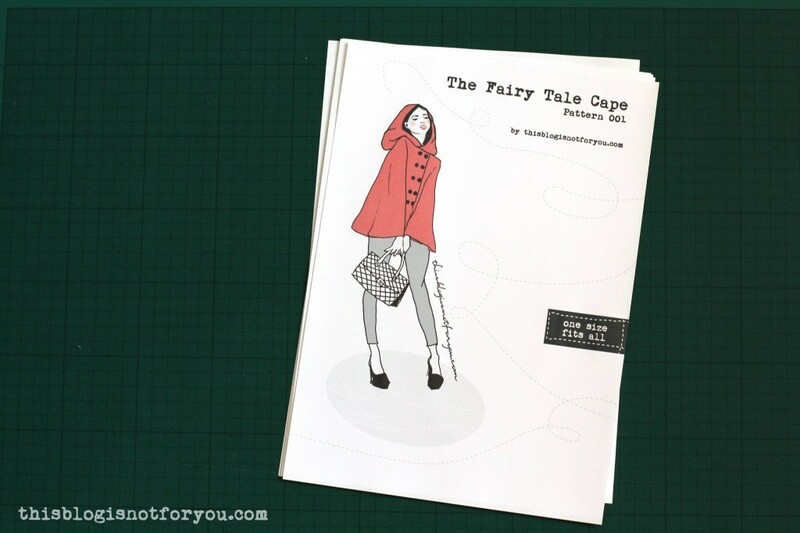 This is the first part of the Fairy Tale Cape sewalong. There will be quite a few sewalong posts coming up in the next few days/weeks. 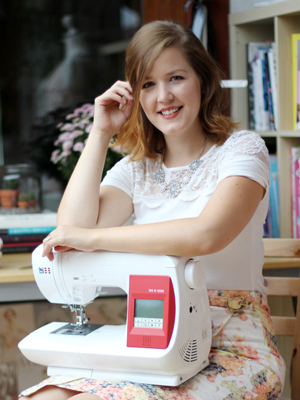 If you’re not sewing along, bear with me – I’ll try my best to throw in some other posts every once in a while! I have yet to figure out the schedule. I have quite a few finished garments that need to be photographed and blogged, but the sewalong will keep me pretty busy! instructions included in the pattern file. 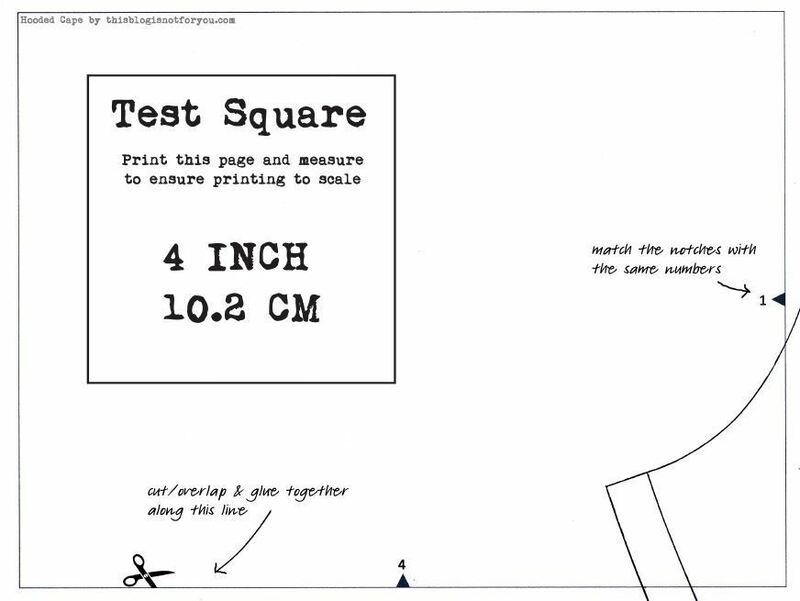 Before printing the complete pattern, please print the page with the Test Square first and measure if the sizing (4’’/10.2cm) is correct to make sure you are printing to scale. It is also important that your printing program is set on “Actual Size”. Do not scale the pattern (e.g. “Fit to Page”) as this will affect the sizing. I suggest leaving the pile of pages after printing as it is (without arranging all of the pages on the floor/table before glueing). 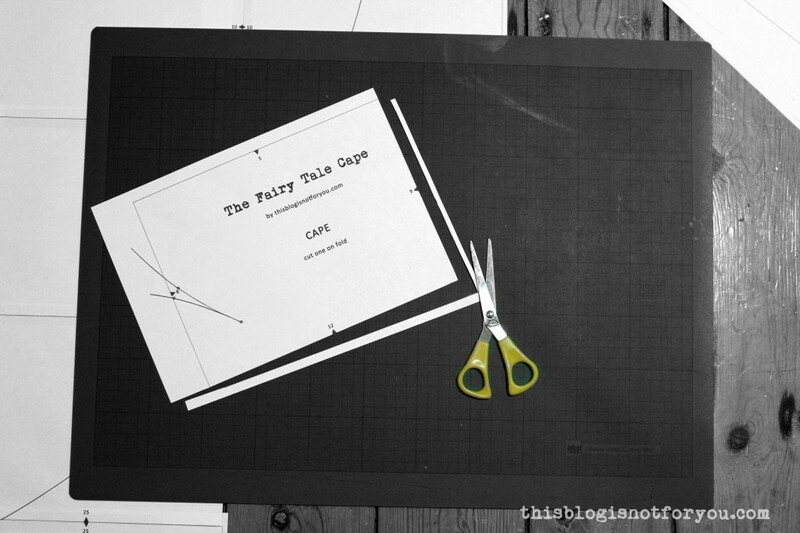 To avoid mixing up the pages & getting confused by the numbers you can cut and glue the pages one by one as you go until you have reached the end of the pile. The pages are arranged in rows (you start assembling at the top/bottom working your way down/up). 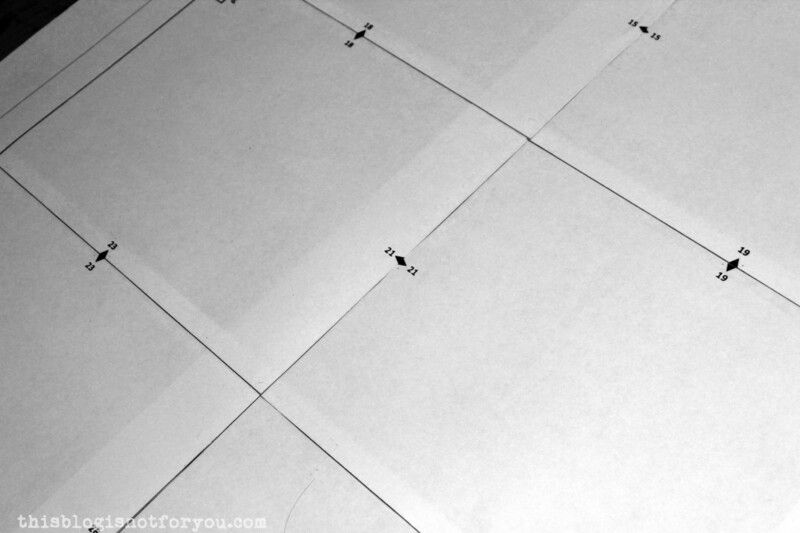 Trim the right and bottom edge of the paper off, cutting on the lines.Then start assembling the pages, either starting at the top or bottom of the pattern. Match the numbered notches on the pattern sheets, aligning the grid lines. Depending on whether you cut directly on or slightly next to the gridlines, some pattern pieces might not match exactly at the notches. That’s ok. Try to match the pieces as good as you can, orienting yourself on the grid and and pattern lines rather than the notches. Use the notches as a guide to match the right pages (they can be a bit off, as long as all the gridlines are parallel/perpendicular and the pattern lines are matched up). 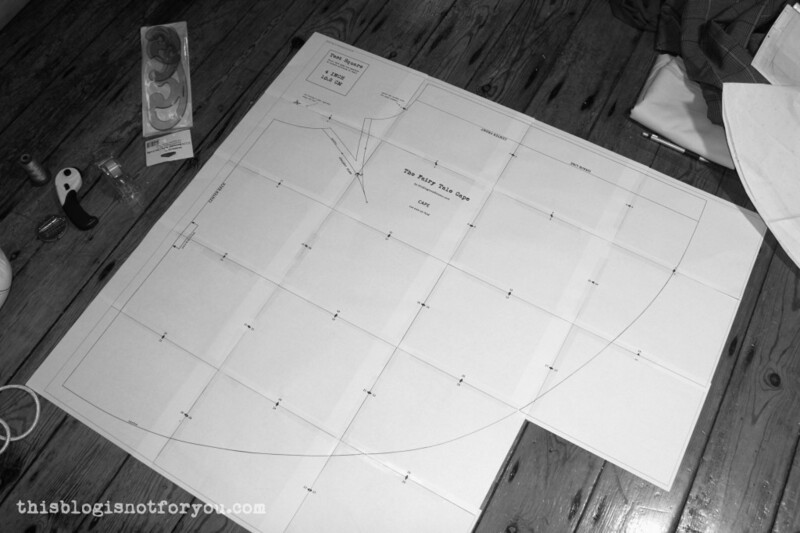 Tape/glue the sheets together and cut out the pattern (seam allowance is included). 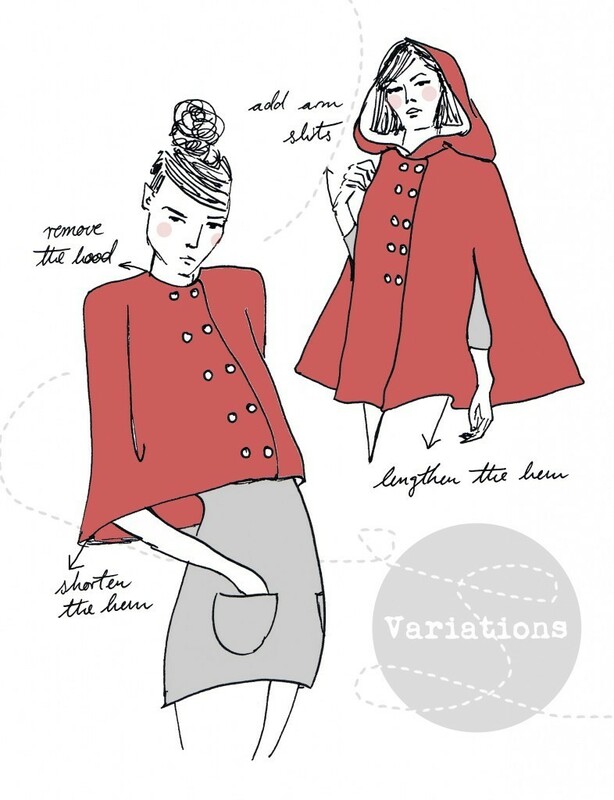 The simple cut of the cape allows for a range of variations. You can remove the hood, add buttonholes or arm slits, alter the hemline and play around with different fabrics and patterns. Different versions may require a different amount of fabric or additional notions, so plan ahead before you start cutting into your fabric. I used plaid linen for this version. For my latest version I decided to replace the hood by a Peter Pan collar. 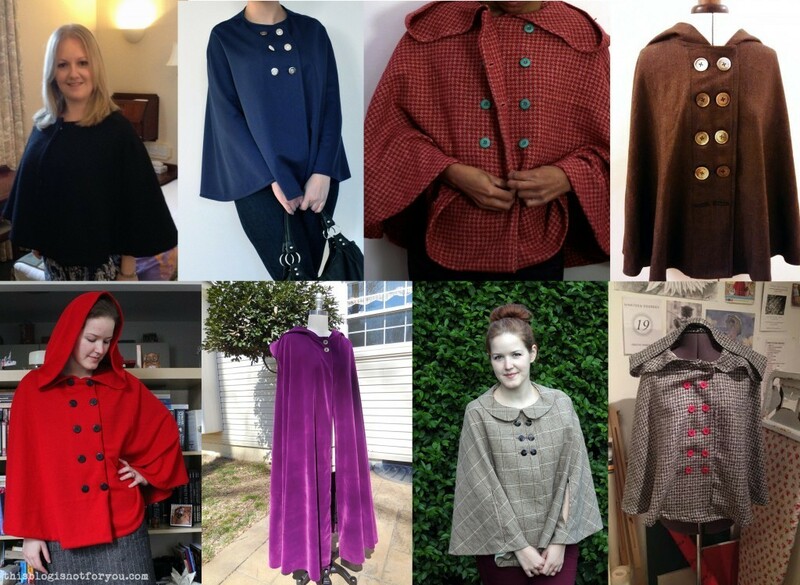 The hood is super cosy and adds a very romantic look to the cape, whereas removing hood or adding a collar gives it a more sophisticated or vintage look. 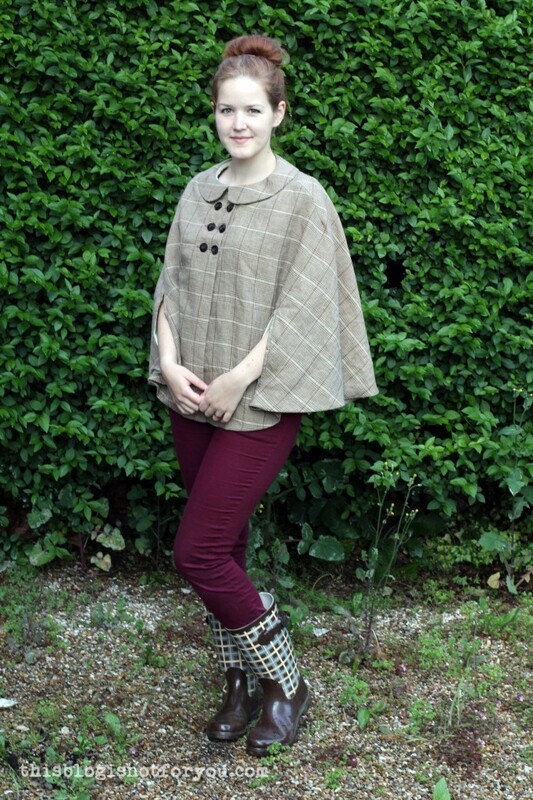 If you want to add a colllar or sew the cape without the hood, I recommend using wovens, as they are more stable and less likely to stretch out compared to knits. It’s only a recommendation – heavier knit-fabric will probably work as well. Just be careful not to distort the fabric. You might also want to use fusible interfacing when using wovens. 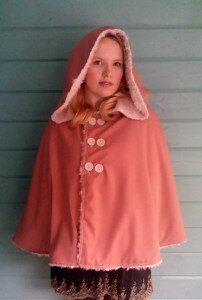 Without the hood, the focus will definitely be on the neckline of the cape, so you want to make sure it looks very neat. Paméla’s cape is made from navy knit fabric. When using knits/jersey you don’t have to worry about adding any closures to your cape. 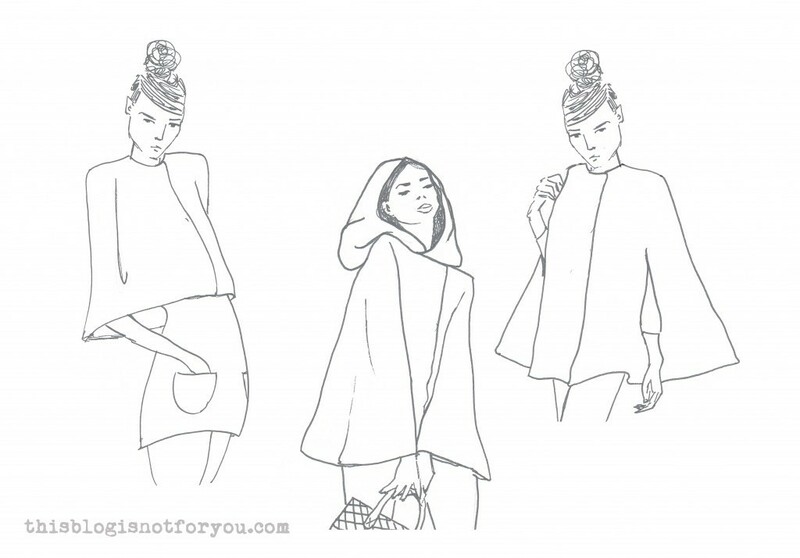 The neckline opening will the wide and stretchy enough for you to just pull the cape over your head like a tee. You can add buttons for some contrast, but this is completely optional. However, when using wovens, I recommend adding actual buttonholes (if you are lazy, you can do this for top row of buttons only and skip adding lining). This will require the use of fusible interfacing and a lining or facing at the front. Think about these things and make a list of the materials you need before you start. The placement and amount of buttons you use also has a big impact on the look of your cape. 1. I used lightweigt knit fabric & 10 large buttons. 2. 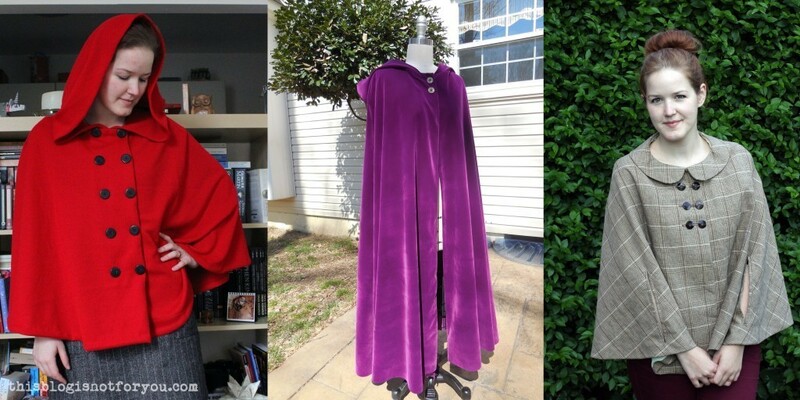 Rachael made her floor-length cape using velvet and only 2 buttons. 3. For this second version I used linen and added 6 buttons and 2 hidden snaps. Altering the length of the cape is pretty straight-forward. You can lengthen the hem by extending the front edge by a few cm/inches (see Rachael’s floor-length version here) and adding the desired amount to the marked hemline accordingly. The same thing applies to shortening the hem. Simply cut off the desired amount, cutting parallel to the hemline. When adding extra length to your cape, consider that you will need a lot more fabric! (It’s similar to making a maxi circle skirt!) The cape is cut as a half-circle and adding a considerable amount of length will require getting a lot more fabric than stated in the fabric requirements. You might even need to add a center back seam in order to fit the altered pattern on you fabric. Adding armslits isn’t as hard as it might seem. I will guide you through the steps with detailed pictures. Armslits don’t neccessarily require a lining, but for a more professional result I’d recommend adding one. The armslits are cut into the fabric at quite a late stage in the process. If your cape isn’t lined at all, you can even decide to add them at a later stage after the cape is finished. Adding armslits does not require much extra fabric, you can even use a different fabric in a contrasting colour. You can use both wovens or knits. I recommend wool, velvet, linen, heavy-weight knits or jerseys. Please note that the fabric choice will have a big effect on the drape of the cape. 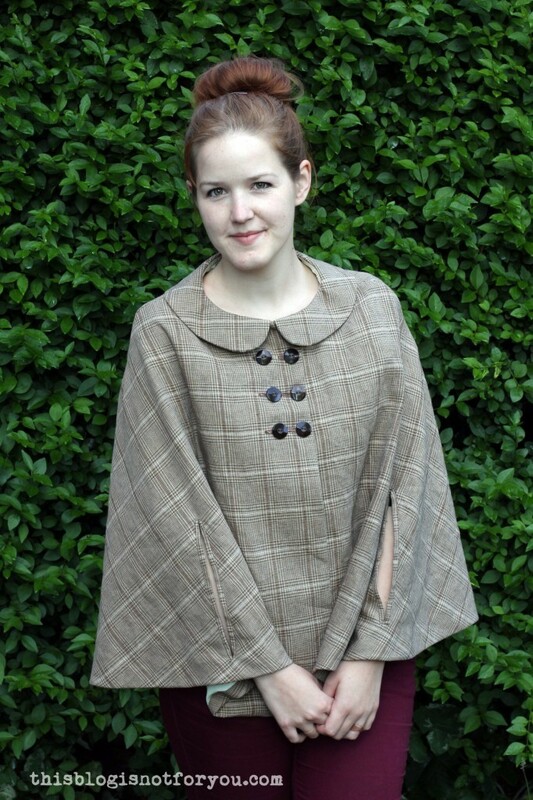 If you want to wear the cape as a cardigan I recommend more light-weight fabrics, such as Jerseys or knits. If you plan on wearing this cape instead of a coat, I recommend using a warm wool fabric. In this case the drape will also be much improved by adding a lining. You can use stretch or non-stretch fabrics. When using non-stretch fabrics, I recommend adding actual buttonholes. That’s it for today! Now it’s your turn to think about the design of your cape and what fabric you want to use for it. To make it easier to visualise your ideas, I prepared a template which you can use to make a sketch of your design. Sometimes it helps to colour in a sketch or technical drawing of a garment to see whether certain colours or prints work or not. It might also help to figure out the buttons and shape of the collar. 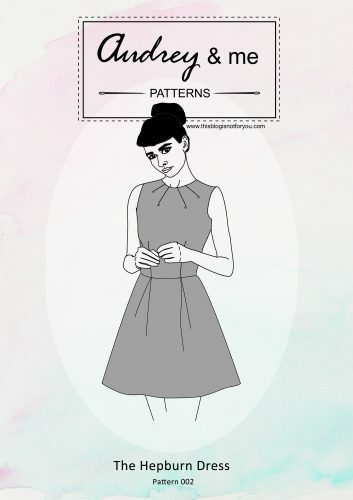 Hi, I purchased your pattern last week, and in trying to make it, noticed it did not have the armslit marks… I can´t seem to find the measurements for them either on your blog… can you give me the link please? Hi there, I’ve got a 108cm bust and am really keen to make the slightly longer cape. Can you possibly point me in the right direction of how I should do my adjustments. Do you think I should slash and add some? How much? How high do I cut the pattern to? How much length should I add onto the hem? I really love your pattern and am looking forward to hearing from you, Katie. Hi Katie! Thanks for making my cape! I can’t give you exact measurements as everyone has a different body shape. Since the cape is very close to a circle skirt shape there is a very large amount of ease in the pattern. So unless you have really wide shoulders, you probably won’t have to make too many adjustments. 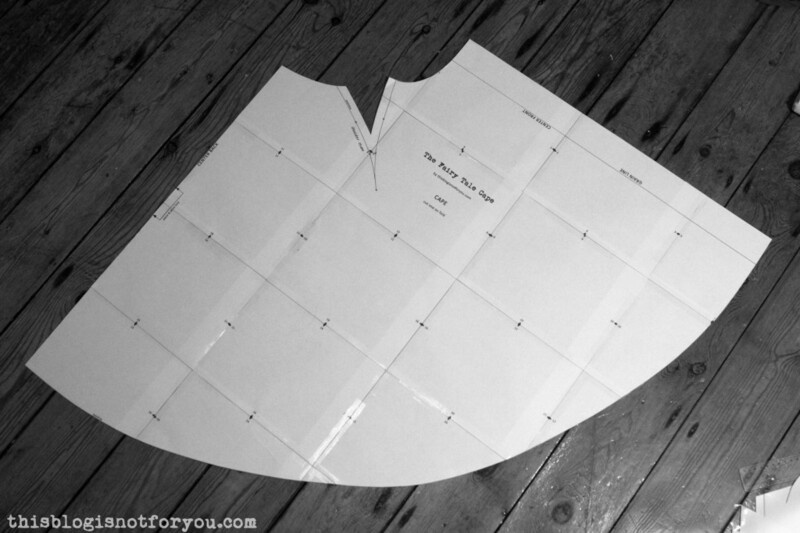 If you want to add a bit of ease around the bust, you can slash the pattern (front and back) starting at the shoulder seam (somewhere in the middle) in a straight line down to the hem. Now you can move the two pieces apart to add some width. 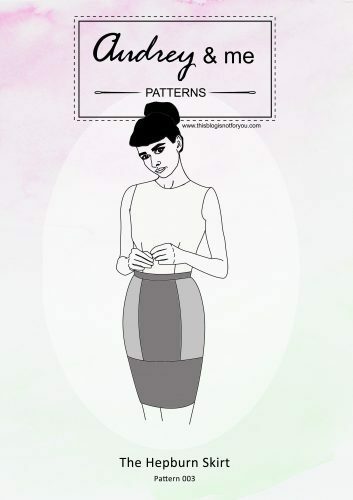 If you want to keep the shoulder lentgh the same, tape or pin the slashed pattern together at the shoulder, only moving the pattern apart at the hem. This creates an upside-down V-shaped gap and will give you a few extra inches around the bust. If you have the time, you could make a muslin first, you might not even need the adjustment. Adding length to the hem is quite easy. How much depends on the overall length you’re aiming at. Stand up straight in front of a mirror and hold a tape measure to your shoulder point. Let the tape measure down to your desired length (where you want the hem to end) and use this measurement to calculate the difference that you have to add. Once you have the difference, you can simply add this making marks all around the hem and then redrawing the hem line. Just keep in mind that the amount of fabric that you need for the cape gets extensively larger the more length you add! I love this pattern. What are you suppose to do with piece 3 in the pattern? Is that what you sew to the interface? It is on page 8 on the pdf. I don’t find it when I print the pattern though. Hi Alexis! Piece 3 is the front facing. As it’s a simple rectangle, I did not put in in the pattern. You’ll find the measurements for the rectangle on page 7! Hope that helps!